Hello! I'm a 31 year old Soccer Coach living in San Mateo, CA. I'm extremely passionate about my work and love my occupation! I've been coaching for over 8 years and playing for more than 20. I'm a Full Time, Professional Youth Soccer Coach and Technical Director at Star Academy FC. I continue to play for fun as part of the Olympic Club Men's Soccer Team. I grew up playing soccer in Beaverton, Oregon where I fell in love with the sport. My interest lead me to competitive soccer through a club called Westside Metros. As a youth player, I experienced winning 4 state championships, participating in the Olympic Development Program and 4 years of Varsity High School soccer. I was recruited and fortunate to play four years Division 1 soccer for the University of San Francisco Dons. We won the 2004 and 2005 West Coast Conference Championship and received three straight NCAA bids. My final season I was selected to the 1st team All - WCC and drafted to the MLS Los Angeles Galaxy. While the soccer was an amazing experience, I developed incredible friendships which I will to cherish the rest of my life. 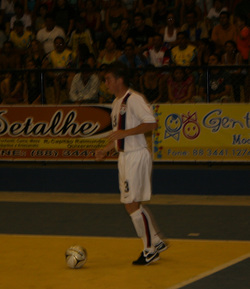 My favorite and most rewarding part of my playing career was competing as a member of the United States National Futsal. Traveling to South America to represent my county only enhanced my dedication and drive to the sport. As we all know, soccer and futsal can feel like a religion in different countries. Playing inside the arena is even more intense. This experience immediately ignited my ambition to introduce and teach futsal to all my teams as it's vital to their development. I began my coaching career through the same club I grew up playing in. Little did I know what I was in for... I was SHOCKED to find out how much I loved teaching and coaching! Having just finished playing, I still had the fire in me. I was determined as all hell to take this little U11 girls team to their highest potential! Funny, I know. Within 3 years, we transformed from an average team to winning the U14 Oregon Premier League. Additionally, I worked with the 5-time state cup champions, Westside Metros Premier. In 2010, we were fortunate to win the famous San Diego Surf Cup. The satisfaction was indescribable. These experiences served as a defining moment to pursue a lifelong career in coaching.